Joint allocation with Route 92A. STL type withdrawn in favour of RTW. Mon-Sat Alperton (ON) allocation introduced. RTW type withdrawn in favour of RT. 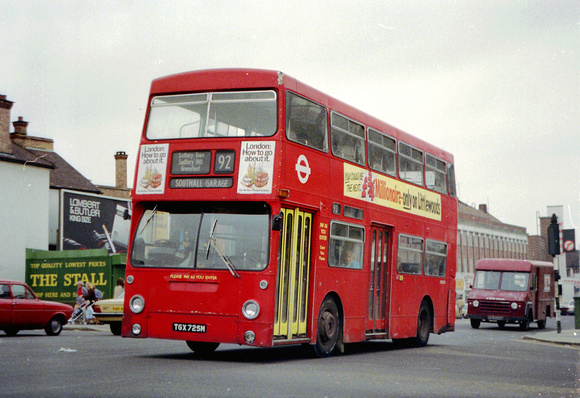 Sunday Route re-routed at Wembley to Preston Road Station and re-numbered 92B. Saturday Southall (HW) allocation withdrawn. Saturday Southall (HW) allocation re-introduced. Sunday Route re-introduced - 92B withdrawn. Sunday Route introduced to Wembley Market. Extended at Southall to Ealing Hospital. Alperton (ON) allocation converted to Metrobus operation. Mon-Sat Route revised at Wembley to operate all day to Trading Estate and re-routed at Wembley Complex Station via The Arena. Empire Way - Engineers Way and First Way to South Way. Daily Alperton (ON) allocation re-introduced. Southall Garage closed - allocation transferred to Hanwell (HL). Operation transferred to London Buslines using Leyland Olympians. Extended at all times from Neaden Tesco to St Raphaels Estate. Frequencies increased and converted to low floor single deck operation. Start of phased conversion to low floor double deck operation. Changeover point Railway Hotel - Wembley.